The great New Zealand rugby writer T.P. McLean declared ‘unhesitatingly’ that Wilson (‘Noddy’) Whineray was New Zealand’s ‘greatest captain’. Colin Meads agreed that as a captain Whineray ‘inspired fierce loyalty’. 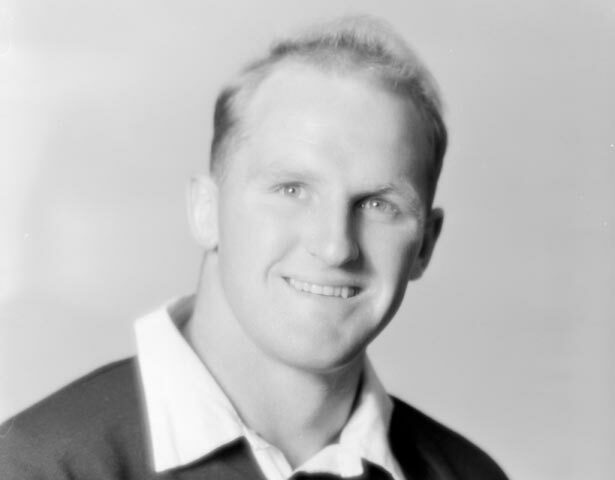 He captained the All Blacks 68 times in his 77 appearances between 1957 and 1965. The All Blacks lost only four of the 30 tests in which he was captain. Awarded an OBE in 1962 and a knighthood in 1998 for services to sport and business, Whineray was also NZ Sportsman of the Year in 1965. The Auckland-born Whineray played first class rugby for an incredible six unions as a result of his time at university and work as an agricultural field cadet. It was for his home union that he played most of his rugby. At Auckland he benefitted from the coaching of Fred Allen and captained the side to unprecedented success in the Ranfurly Shield. Primarily a loosehead prop, Whineray was part of a formidable All Black pack that included Colin Meads, Kel Tremain and Ken Gray. It was often argued that he was a better leader than scrummager, but according to Colin Meads it was ‘hard to recall a time when our scrum suffered because of any weakness’. A lineout move perfected by the All Blacks on the 1963–64 northern hemisphere tour was known as ‘Willie Away’ after its key feature, which involved Whineray peeling away from the lineout to receive the ball from a halfback position to set up attacks in midfield. Following his retirement from the game Whineray studied as a Harkness Fellow at Harvard University and carved out a successful business career. His status in the game was recognised internationally in 2007 when he was inducted into the International Rugby Hall of Fame in London. He died in Auckland on 22 October 2012. We have 12 biographies, 6 articles, related to Wilson Whineray.